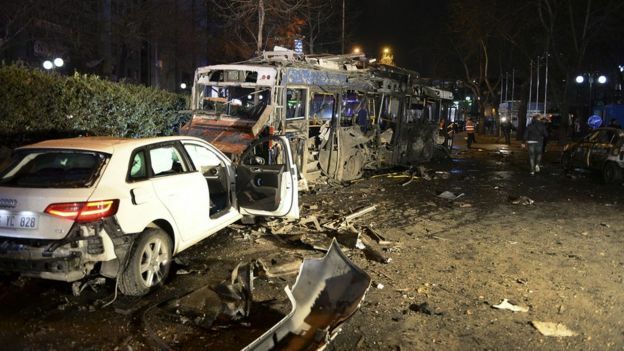 A car bomb has exploded in the Turkish capital Ankara, killing 32 people and wounding more than 100, the health ministry has said. 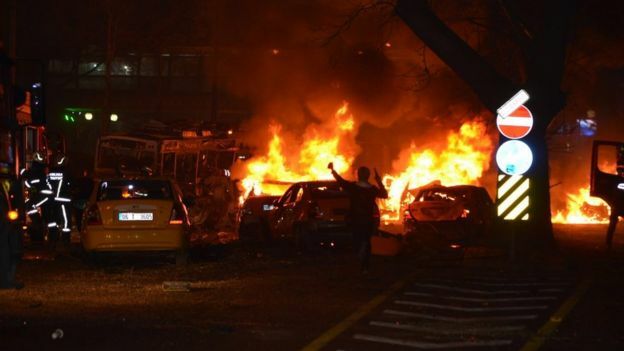 The explosion happened in Guven Park in the Kizilay district, a key transport hub and commercial area. Several vehicles at the scene were reduced to burnt-out wrecks, including at least one bus. President Recep Tayyip Erdogan said terror groups were targeting civilians because they were losing their struggle against Turkish security forces. He said such attacks "increase our determination to fight terrorism". 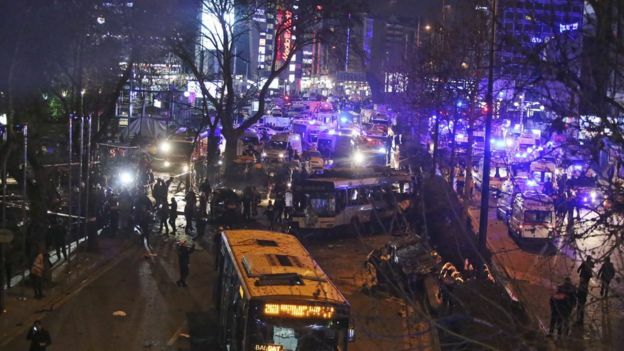 Turkish Health Minister Mehmet Muezzinoglu told a news conference that 30 people were killed at the scene and four died later in hospital, however two of the dead are believed to be the attackers. 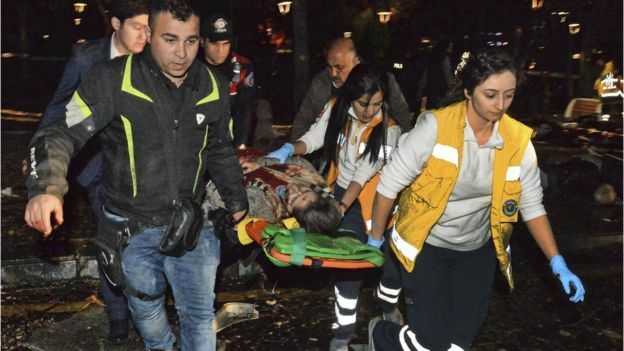 He said 125 people were being treated at several hospitals in Ankara, of whom 19 are in a critical condition. 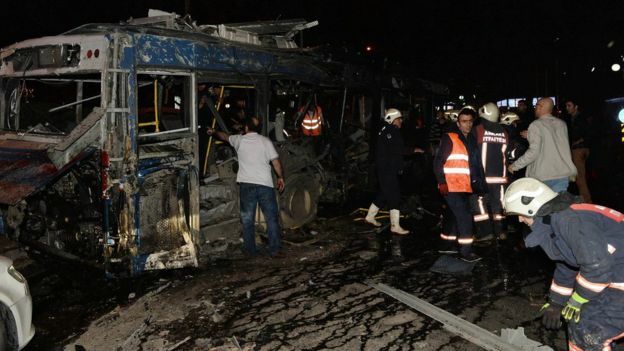 Interior Minister Efkan Ala said the investigation would be concluded on Monday and those behind the bombing would be named. The ministers were speaking after an emergency security meeting called by Prime Minister Ahmet Davutoglu. Hurriyet also reported that a court in Ankara had ordered a ban on access to social media, including Facebook and Twitter, saying it was to stop people sharing images of the attack. The BBC's Mark Lowen in Istanbul says three attacks in the Turkish capital in less than six months show the multiple security threats that Turkey now faces. The country that was the stable corner of the Middle East and the West's crucial ally in a volatile region is now at a dangerous moment, he adds. Meanwhile, it has emerged that the US embassy in Ankara warned its citizens on 11 March of a "potential terrorist plot" in the city. Last month's bombing was claimed by a Kurdish militant group, the Kurdistan Freedom Hawks (TAK). It said on its website that the attack was in retaliation for the policies of President Erdogan. Turkey, however, blamed a Syrian national who was a member of another Kurdish group. Last October, more than 100 people were killed in a double-suicide bombing at a Kurdish peace rally in Ankara.